After Government initiative on FDI & various economic reforms Sensex has surge by 404 point in single day and reached to level of 18752 on September 21, 2012. Continuing positive momentum today Sensex has closed on level of 18869. From past few months we keep on listening that Sensex is giving negative return or giving few percent returns. Overall downturn of market may be due to world economic condition and euro zone crisis. Perhaps due to above reason many investors had moved out of equity market or prefer to stay away from equity market in 2012. But few investors had confidence in continual falling market and these fortunate investors had got classic returns in 2012 by equity investment. You may be thinking that which stocks has given classic return in 2012. 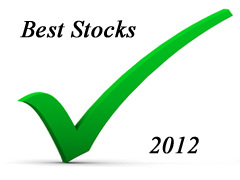 We are herewith Best stock of 2012 by performance. These stocks have given best returns on investments. In contrast to 2011, when mid-cap stocks were scaling new heights, this year has seen majority of large-caps & some midcap has turn the show. Total 21 such stocks are indentified by us from 6 different sectors. Return range is in between 365% to 33%. Top performing stocks from FMCG sector are ITC, Hindustan Unilever and Marico. Stocks of Pharma companies have also seen a sharp upward movement and stocks in which we have observed upward movements are Divis Lab, Sun pharma, Lupin. Besides these, companies from the banking and financial services has also provided good return in 2012. Bajaj Finance, Gruh Finance,Yes Bank and Indusind Bank are hero in this category. Cement stocks are also in race and stock such has Shree Cement, Ultratech and Ambuja has given good returns in 2012. Apart from this in Information technology we have Vakrangee Software & Hexaware Technologies as top performer of 2012. 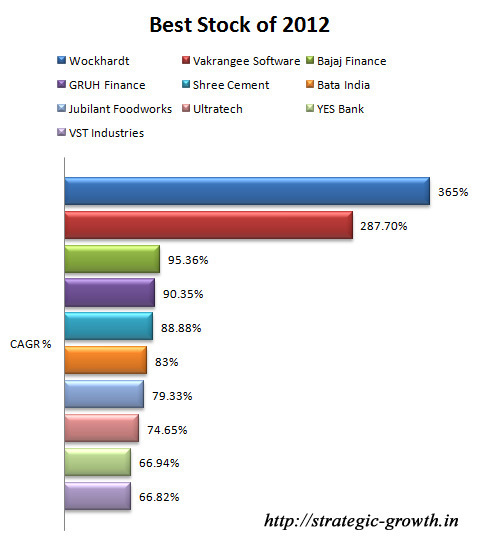 Other performers of 2012 in consumer sector are Bata India, Jubilant Foodworks, VST Industries & TTK Prestige. So, Top performer of 2012 is from pharma sector Stock of “Wockhardt” has given extra ordinary return of 365% in just 10 months. This stock was quoting just 279 Rs/- on 2nd January, 2012 which has reached to 1298 Rs/- on 3rd October, 2012. Similar to this stock from Information Technology sector Vakrangee Software is given return of 287 % in just 10 months. However, though stock mention above has given best return in 2012, it does not mean you should liquidate all other investments and invest in these stocks. 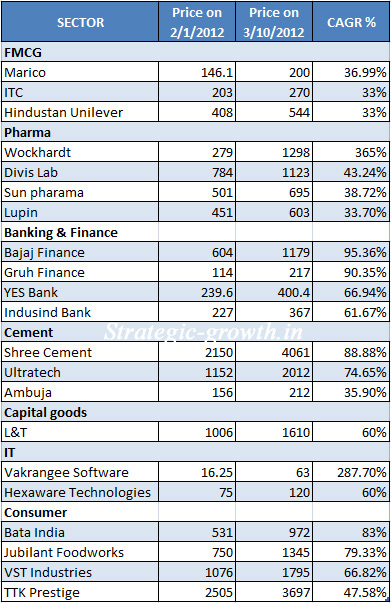 These stocks can continue performing well in future but careful review is required before making investment in these stocks as most of these stocks are at peak. Do share your comment on this. Really amazing….do you think I should invest in this stocks at this level.